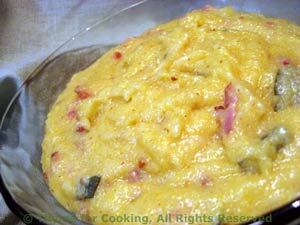 Creamy Polenta with Bacon and Sage, Thyme for Cooking easy gourmet sides. Use quick cooking polenta. Check the package directions for quantity proportion - you may have to add more (or less) liquid to get a soft consistency. It can be adjusted at the end, before serving. You can add a bit more milk to thin. It should be like mashed potatoes - but studded with crisp bacon and fragrant sage! Slice bacon crosswise into 1/4 inch strips. Sauté in a small saucepan over medium-high heat until crisp. Remove and drain on paper towels. Pour off all but 1 tsp fat from pan. Add sage to pan and sauté briefly. Slowly pour in polenta, whisking constantly - or it will have little volcanic eruptions spewing polenta all over your cook top. When done, stir in milk, Parmesan and bacon. Serve.